Since we aren’t visited by that weird quarterly occurrence some regions of the world know as “seasons,” there’s really not much to say for autumn, except that it’s kind of cute how some people actually consult a calendar before deciding what kind of “seasonal” treats to make. Again, not in my vocab. Around here, the running desserts philosophy is: if it rocks, make it. And then devour it. Lather, rinse, REPEAT to vaguely revolting extremes. So even though I’m technically celebrating squash/autumn season with the fantastic #SundaySupper crew today, the Gods of the Paradoxical Realm I occupy have reassured me that it’s still summer, somehow, somewhere. So lucky me, and now lucky you–we can have our squash, and eat it too! No matter what bizarre climate zone you inhabit, these aseasonal pumpkin pie layer cheesecake bars will be a total hit. I brought them to a friend’s place during our trashy Bachelor in Paradise viewing party (um, but let’s not talk about that) and they got gobbled up, right next to some delicious Rocky Road Brownies that I’m going to be sharing with y’all next week. The breakdown, as the pictorial walkthrough demonstrates, is dangerous and fantastically delicious. The vegan shortbread crust is my absolute favorite crunchy shortbread recipe to date, and without any butter, it manages to top all. Of course, the real topping–a healthier applesauce cinnamon streusel–is the bomb. These double fillings: wow. Just, wow. I wanted the classic pumpkin pie flavor to shine but have been on a cheesecake kick lately, so I threw together the best of both worlds and am giving you an awesome deal my Asian side can’t resist–two-for-one! Creamy, subtly tangy pumpkin cheesecake topped with a kick-arse pumpkin pie filling. What’s not to love? So whether you’re still receiving 14 ridiculous hours of unadulterated sunshine a day in your neck of the woods, or are feeling the creeping impending shadows of autumn lurking in every bare tree branch: make yourself a panful of these, slice up a bar, and kick back with a nice glass of milk. Trust me on this one. Creamy layers of healthy pumpkin pie filling and pumpkin cheesecake, stacked on top of a delicious vegan shortbread crust and topped with a healthified butter-free cinnamon streusel. This is a fall treat that can't be beat! Preheat oven to 350 degrees F. Lightly grease a 9x9-inch baking pan and set aside. Combine all ingredients in a large mixing bowl until it forms the texture of wet sand. Press evenly into the bottom of prepared pan. Bake for 12 minutes, until lightly golden. Remove from oven and set on stovetop while you prepare the fillings. Using the same bowl (no need to wash it! ), cream together cream cheese and sugar until completely smooth and fluffy. Beat in milk. Add egg and mix in until just combined. Mix in yogurt, vanilla, and pumpkin. Stir in flour. Pour cheesecake filling over shortbread crust. Bake in oven for 5-7 minutes, until the edges have just begun to set. Remove from oven and set on stovetop while preparing pumpkin pie filling. Using the same bowl (no need to wash it! ), combine all filling ingredients. Spoon over the prebaked cheesecake layer. Combine flour, oats, nuts, sugar, and cinnamon in the same large mixing bowl (fun, right?). Add applesauce or melted butter, and stir until a mushy clump starts to form. Break up clumps and sprinkle evenly over the pumpkin pie layer. Bake everything for an additional 25-30 minutes, until a toothpick inserted in a spot without streusel comes out fairly clean, and the bars jiggle only slightly when you shake the pan. Allow to cool completely before refrigerating for an additional 5-7 hours. Cut into bars and store leftovers in fridge. I’m in NY where we still have the central air on – in September! Not something I remember much in years gone by….but for some reason when August gets here I start thinking fall foods and baking even though this year its been highly humid and very hot still! 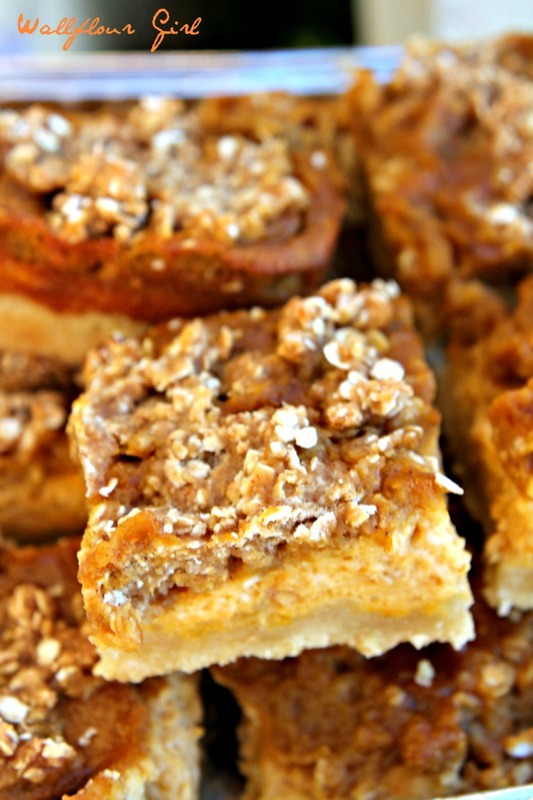 Your Pumpkin Pie Bars look and sound amazing! Defnintely a recipe to have in my pumpkin recipe file! Yes, my friends make fun of me for making pumpkin desserts sometimes starting in spring–but if you’ve got the hankering, embrace it, I say! New York must be soooo humid right now.has fall really not started yet? These would be a perfect autumn kickoff–thanks, Shelby! Hehe, I know what you mean. It doesn’t feel like fall here yet either. 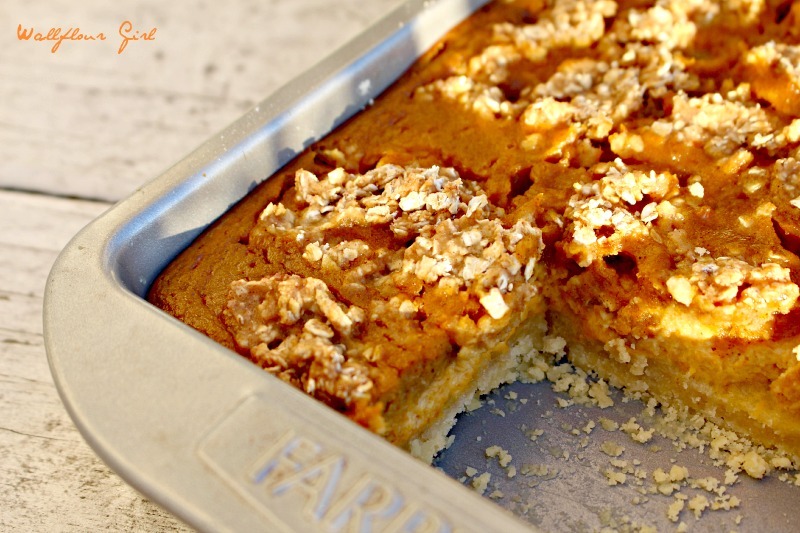 I do love pumpkin treats though and can have it all year round 🙂 These pumpkin bars look incredible! Love the vegan shortbread crust and the cheesecake layer – so irresistibly good! Ooh remind me again where you’re from! I’m drawing an awkward blank for some reason….but I totally agree. Pumpkin all the time, any time!!! And I LOVE this shortbread crust so much, I can’t even…!! Oh, yeah, I’m not letting summer go either!!! 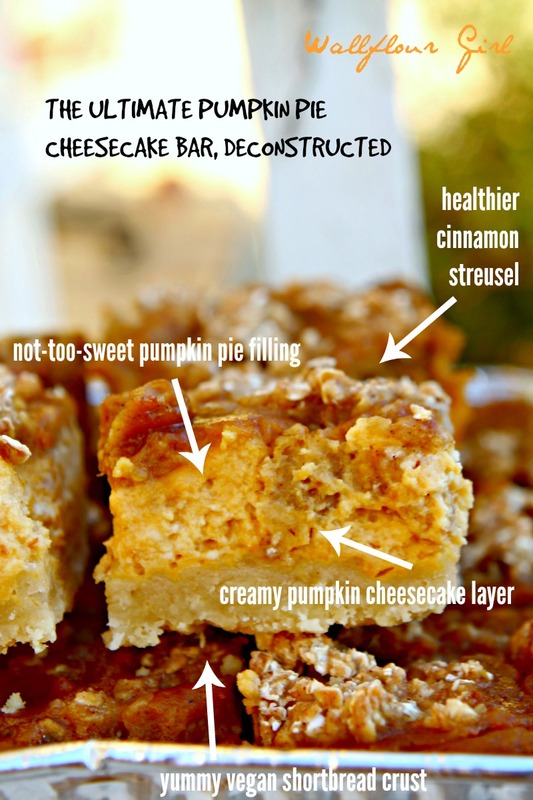 But I’d be happy to indulge in your amazing pumpkin cheesecake bars! Wow, so many layers of deliciousness, Ala!!! Whoohoooo! What’s the climate like in your parts right now? Still humid? I want to exchange fall recipes and bake with ya all summer long! Oh my goodness, this dessert is over the top amazing. I must have some in my life!!! 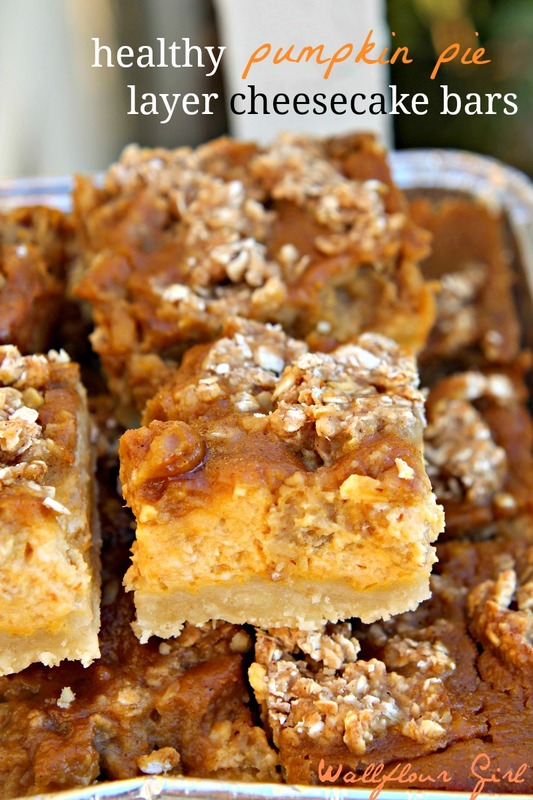 Well, let me introduce you: Katie, pumpkin pie cheesecake bars. Bars, Katie! Now go get some, girl!!! Yummy! It looks so moist and delicious! I would love this with a big cup of coffee. Let me bring you that asap so you can enjoy this!! But oh my gosh, yes, this would be amazing to serve with a cuppa. Off to check out your recipe this week, Jen! These look AMAZING! I’m always looking for healthier options when it comes to desserts. Great #SundaySupper contribution!! Aww yes and this is a great easy one to make subs with! You’ll love it, Wendy. Hope you have an AWESOME week ahead planned! Pumpkin Pie and Cheesecake? An enchanting dessert to begin fall baking! Love that you made these healthier and they still look like an indulgent treat! I’m sooooo not saying good bye to summer. It needs to stay forever!!! Yes let’s sign a petition to keep it going! This is a totally great transitional healthified treat. Hope you’re having a fantastic week! 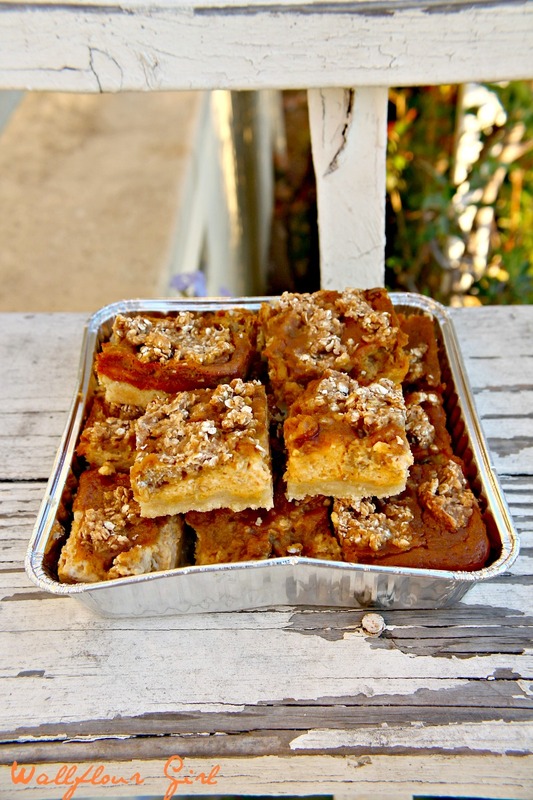 Your philosophy about dessert is akin to my own, Ala =) It’s an enjoyable and easy philosophy to follow especially when armed with vegan-crusted pumpkin cheesecake bars! Haha! I kove how you think: I totally need to arm myself for this dwsserts warfare. Fighting for our rights to bear dessert forks!! Those are stunning Ala, really delicious looking!! Thanks a bundle, Tara–hope you’re having an awesome week! gosh – I’m just going to have to make this for my kid’s next school bake sale! 🙂 You are always creating something fabulous Ala! 🙂 Thanks for sharing! Thanks and same to you, Alice–we are definitely on the same dessert wavelength! I’d love to hear how the bake sale goes–it’s so great that you participate! How fun that must be! Ok, this is just too good to be true. I need these in my life. I’m saving this for Thanksgiving, definitely! NOOOO! I don’t care how yummy those look, it’s NOT fall yet. The weather here dropped 20 degrees overnight, and the supermarkets have their stupid pumpkin displays out. We can totally enjoy pumpkin while it’s still summer. Especially these. Holy cow. I’m in love. Yesss, totally agreed! I’m sending a beach ball and sunglasses your way so we can go enjoy with a plate of these, okay? Ala! This recipe came at the perfect time! I’m going to a dinner party in a few weeks and the hosts are on a restrictive diet due to a crazy list of food allergies. Minus the cheesecake layer, I think they’re able to eat every single ingredient you used. You’re a life saver. I can’t get over that crust – it looks as glorious as a full fat/butter crust! Oh yayy!! Your comment made me so happy–I’d be thrilled (and I’m sure they would be, too) if you made these for your party. Let me know how it goes for you! And I swear they sell vegan cream cheese at some specialty stores, maybe you could try it with that? Gooooo do it, and go be the awesome lady you are! I like your desserts philosophy. I only wish I liked pumpkin. Perhaps butternut squash would do as a great substitute. The bars sure do look wonderful. Renee, that is such a fantastic idea! Gooo do it, I’d love to hear how that turns out because it sounds AMAZING! Oh my gosh! Are you from Palm Springs, Christy? I think we’re not too far from each other (er, but I haven’t looked at a map recently, so I can’t be sure). This southern weather is SO. Deceptively. NICE. Though, isn’t it?! I’d totally send you these bars to celebrate summer with, though! Ha! Dawwww yeah, I abide by my mantra a little too much for my own good, I think 😉 ah well, c’est la vie! I hope you’re having fuuuun / had fun on your awesome science retreat! I can attest to the fact that these are scrumptious. Thanks for spreading the pumpkin love, Ala! Aww you’re so sweet, Ellen! I’m still sorry about plopping them on your table and running. But I’m glad you loved them! Thank you! These look Amazing! I love pumpkin and I love cheesecake, so I almost died when I found these. I’ll have to make them when my workload dies down. Thanks for the recipe! Keep up the good blogging! I love pumpkin and I love cheesecake, so I almost died when I found these….so amazing and delicious… I’ll have to make them when my workload dies down. Thanks for the recipe! Keep up the good blogging!